ETC Hire has high quality Brisbane and Gold Coast portable traffic lights available for hire at competitive rates. Our traffic lights meet all of Queensland’s safety and legal standards, as well as Australian standard AS4191. Our portable traffic lights are designed and made in Australia to suit the extreme environmental conditions. These are also trailer-mounted for mobility to effectively navigate any work site or region. Portable traffic lights can be used individually or linked with other sets to create larger systems. 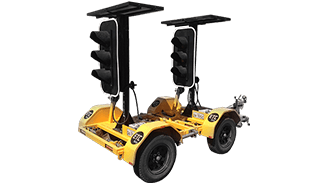 ETC Hire is the only company in Australia which supplies pedestrian mode portable traffic lights for hire. Our portable traffic lights are solar powered, so there’s no ongoing running costs. Additionally, being solar powered means these are eco-friendly with zero emissions. You can choose to hire a single set or multiple sets of portable traffic lights. When multiple sets are linked together, these can efficiently several road systems at once. This improves the visibility and the impact of the message displayed. With nine frequency channels, the portable traffic lights operate in a variety of ways. Contact us today for a quote on our Brisbane and Gold Coast portable traffic lights and traffic equipment hire.